Okay, now that we’re intrigued … what’s the longer description? “A wild, impressively choreographed romp that is by turns hilarious, heart-rending and in small glimpses, beautiful,” –Marble. The show begins with the two grade-eights presenting their high school assembly. Very soon, the students go off-script, barring the doors and hijacking the school presentation to deliver an important message: They will be dead in an hour, the apocalypse will occur in five years, and they’re here to train you how to survive. 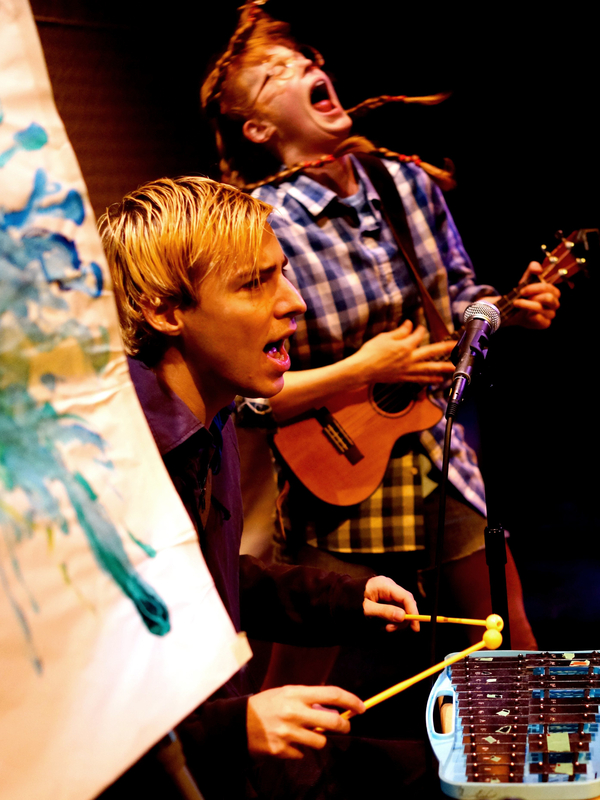 Seen through the eyes of two imaginative teens – the precocious Kitt and an awkward boy with the unfortunate nickname ‘Jane’ – apocalypse survival is articulated with jams on the glockenspiel and ukulele, giant-scale shadow puppetry, and fast-paced physical humour. A hilarious romp and a poignant exploration of the world today’s youth are inheriting and what they’re prepared to do about it. Now that we’re past the 2012 end-of-the-world scare, what inspired you to create Kitt & Jane? I watched my co-star Rod Peter Jr puppeteer a rat puppet singing a beautiful Bob Dylan song at a cabaret night in Victoria and said, ‘I want to work with that guy.’ So our director Kathleen Greenfield put Rod and I in a room full of cardboard and told us to build something amazing. At that point cardboard was a big part of the show. Not so much anymore. We moved on to giant shadow puppetry and the glockenspiel. He’s a very funny guy and the three of us come up with some pretty deliciously weird stuff together. I remember being 12 years old and flipping through dog-eared copies of National Geographic magazine, adding up all of the looming catastrophes of the world and coming to the conclusion that I might not survive long enough to be an old person, or if I did the world was going to be an entirely different place from the world my grandparents are growing old in. And at age 12 that didn’t intimidate me, if anything I was excited for the challenge. We draw on existing scientific reports about technology run rampant, overpopulation, genetically modified food, species extinction, and the end of cheap oil. We created a song detailing the realistic possible future scenarios developed by the international think-tank Global Scenario Group (gsg.org). Tell us a bit more about the interviews you conducted with teenagers as part of the creation process of Kitt & Jane – what were you hoping to get out of the interviews? What surprised you the most? Come if you like adventure, if you’re sick of hearing people complain about our destructive culture and need to laugh about it for a change, if you watch the Walking Dead, if you read George Orwell, Margaret Atwood, David Suzuki, or, best of all, if you want free cake, because we give out free cake as part of the show. People have said that watching our show made them feel ALIVE, left them feeling all tingly. Perhaps they just needed to pee or their foot fell asleep but STILL, for me that’s the goal – to feel alive together. And eat cake. Bonus question: Any names you want to drop who have been involved in your show? John Cleese. Sandra Bullock. Jim Hensen. Miss Piggy. Harrison Ford. Martin Luther King. Michael J Fox. Terry Fox. Fantastic Mr. Fox. You. Tagged: Edmonton Fringe Ingrid Hansen Kathleen Greenfield Kitt & Jane Kitt & Jane: An Interactive Survival Guide to the Near-Post-Apocalyptic Future Rod Peter Jr.